Kawasaki Forums: Kawasaki Motorcycle Forum > General KawasakiForum Discussions > Racing News > Jorge Lorenzo to ducati????? Jorge Lorenzo is going to ducati?! I can't find a link that I can watch MotoGP online for Free......know of any? i hear ya! i dont watch tv much anymore either, its not like how it used to be. and 66 for me is "VS" not sure what it is but i clicked on it and it showed people running around a track. for me speed is 31 and i checked, thats what channel its on. Ive just been getting into it this last year. I'll try to watch a race if/when its on tv. So i wont really know what the hell im talking about for a while but i though another popular rider just joined Ducati, or maybe he left i cant remember. Jorge is pretty badass though on the Yami so itll be interesting to see what he can do on a twin. I also love drag racing (cars AND bikes) not that i do it...yet, but i like to watch. Im into Nascar too even though its been sucking really bad these last few years. yeah i dont get to see the race too much but if its on when im watching tv i watch it. lorenzo is a badass on the yami and it definitely will be interesting to see what he can do. Last edited by KarSung; 08-22-2009 at 09:46 AM. +1 on the bikes not being able to win by themselves! and hell yeah! 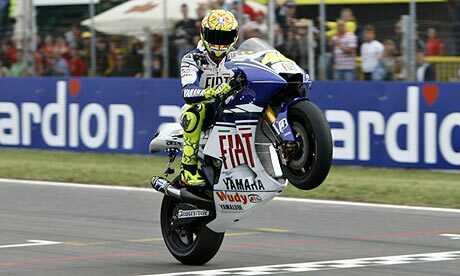 rossi is a beast!